Refreshing and fun, Adam Vincent Wright‘s 2018 short film, with the peculiar title Timmy Slays the Talent Show, is the perfect flick for the Tumblr/YouTube generation. The plot of the movie highlights the conflict between generations, the freedom of expressing oneself and close-mindedness by featuring a stereotypical overly religious and strict stepdad who disapproves of the fact that his soon to be son lacks masculinity and doesn’t fit it the way he believes boys should look and act. 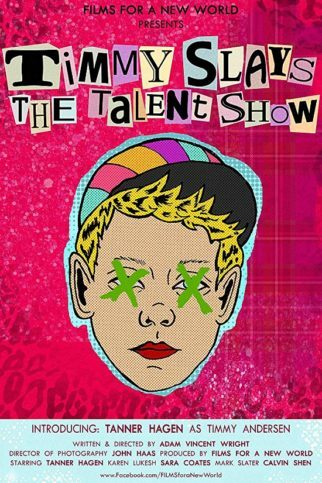 It all culminates during a community talent show in which Timothy delivers a unique dancing performance dedicated to his step-dad. Characterization through appearance and detailed set design play an essential role in the film’s appeal. All the adjectives I used to describe the 2012 short film from Switzerland Hazel: flamboyant, quirky, funny and provoking are a perfect fit for Timmy Slays the Talent Show as well. Only the plot is deliberately stereotypical. The character of Timmy brings parallels between Desmond is Amazing (Desmond Napoles) and Billy Elliot. After witnessing the fantastic dancing skills of Tanner Hagen at the community talent show – it doesn’t come as a surprise that Tanner played the role of Billy in the Duluth Playhouse production of Billy Elliot The Musical. Unfortunately, the acting is mediocre at its best. Yet the message of the film (staying true to oneself) comes across successfully.